Mormon Wookiee: #15: "Fast and Testimony Meeting" in the 13th Ward. #15: "Fast and Testimony Meeting" in the 13th Ward. Growing up, there was one particular Sunday that I really didn't look forward to--the first Sunday of each month. For those of you who may be unaware, as a Mormon, sacrament meeting on the first Sunday of each month is known as "fast and testimony meeting". 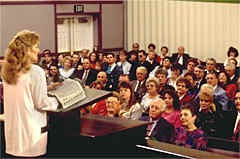 In this meeting, after the sacrament is passed, the pulpit is made available to any member of the congregation to come up and share his/her testimony. Fast and Testimony meeting...during the 80's. There are some humorous situations that occasionally occur during a fast and testimony meeting, such as when people get up and go off on a wild tangent unrelated in any way to their testimony or when 10 kids get up in a row and share the same testimony ("I know the church is true. I love my mom and dad...etc.). These things don't really bug me though. In fact, I actually enjoy them. However, there is one aspect of fast and testimony meeting that I dread. It is something that I like to call the "unbearably awkward Mormon pause" (uaMp for short. Trademark pending). The uaMp occurs right after one person has finished sharing his/her testimony and no one else is in the queue to go next. Usually someone will get up within a few seconds and the uaMp will not have time to grow and fester. However, sometimes the uaMp is simply destined to occur. When this happens, each second of the uaMp becomes more and more awkward. As the time of the uaMp drags on, people either duck their heads or frantically look around the room to see who will get up next. Once, in one of my old wards, the uaMp actually went on for eight minutes! Eight minutes may not seem like that long, but to me it was like an eternity. The bishop finally had to get up himself and remind the congregation of the importance of sharing our testimonies. Well, as much as I dread the uaMp, for some wonderful reason it rarely occurs in my current ward. I don't know how I got so blessed to be in the Riverton 13th ward, but I absolutely love it. Fast and testimony meeting in the 13th ward is a powerful example of how great a sacrament meeting can be. Today, our fast and testimony meeting was a spiritual feast. I would like to highlight a few of the testimonies that were given, because they are just a small sample of the type of testimonies we hear each month. Our Elder's quorum president and his wife both bore powerful testimonies of the scriptures, baptism, and the truthfulness of the gospel. They expressed gratitude for all of the blessings the gospel provides. Their son was baptized yesterday, and you could see the joy it brought to their family. Their enthusiasm and excitement was contagious. A recently returned sister missionary and her two teenage sisters all bore their testimonies about the influence of the Savior and the atonement in their lives. One of them used to be in my Sunday School class (before I got called to primary), and she was always a great example of faith, cheerfulness, and obedience. A humble father got up and bore his testimony about the importance of the Book of Mormon. He is a continually faithful example as each month he courageously gets up and bears a sweet testimony. He makes me want to be a better person. A mother of five children told a story about a stake conference a couple of years ago where the Jordan River temple president spoke during the meeting. He encouraged the congregation to make it a goal to go to the temple each week. As a mother of five, she felt like this was an impossible request. But, after softening her heart, she committed to do whatever it takes to go each week. She has kept up this habit for more than two years. She spoke of the connection she has developed with her ancestors by preparing their names for the temple. She also said that going to the temple each week has helped her to keep a calm and peaceful feeling in her home. One of my favorite teenagers in the whole world bore his testimony about the power of prayer. He spoke about the stress he has been under with trying to maintain good grades while still committing time to the school football team. After a sleepless night, he knew that he could not do it all himself. He knelt down and asked Heavenly Father to help him get the grades he needed, if he gave his best effort to study. At that time, he had a number of B's and B minuses. By the end of the quarter, his grades had improved to straight A's and a 4.00 GPA. He expressed his gratitude to the Lord for watching over him and supporting him in his efforts. A mother in our ward spoke about our tendency to get distracted by things that don't matter. She said that she is trying harder to focus on her blessings. She made the observation that we have the tendency to skip the importance of Thanksgiving by going straight from one commercial holiday (Halloween) to another (Christmas). Another mother started her testimony by singing a solo hymn about families. Although it is unconventional for someone to sing their testimony in fast and testimony meeting, it had a very powerful effect. She then spoke about the fear her young son has of water. He is having a difficult time with the thought of getting baptized, because he is so afraid of the water. She spoke about how this experience has helped her gain patience and asked for our prayers and support in her son's behalf. Last but not least, our humble high counselor finished the meeting with a testimony of the powerful influence of good neighbors. He told a story of when he was a newly married father with a young son. He and his wife were less-active members of the Church and attended Sunday meetings only infrequently. The members of their new ward embraced them, served them, and invited them to come back to Church. He was called to serve as the Young Men's president, even though at the time he did not regularly attend the ward. Eight months later, he, his wife, and their young son were sealed for time and all eternity in the Salt Lake temple. I couldn't agree with you more, today's meeting was incredible. I cried and enjoyed all of it. And as incredibly spiritual as the high counselors testimony was, I loved his ability to laugh and keep us laughing. He's a great guy. We have an amazing ward, my family members have made that comment more than once after visiting our ward for baby blessings. We are very blessed, and you and your sweet wife definitely add to it! I'm so glad the uaMp has a name now. Thanks for sharing these! They're still touching, even though I don't know any of these people. I'm a little late to the party; I LOVE those pauses because it allows the spirit to build and confirm to my soul the truthfulness of what has been said; also it allows me some peace and quiet to ponder and contemplate all of my blessings. I'd rather have a pause than someone getting up and giving a rote testimony just because they can't stand the quiet. But then, I've always been different.